I found this great graph at the website of the Financial Times. It is from a paper of Branko Milanovic. 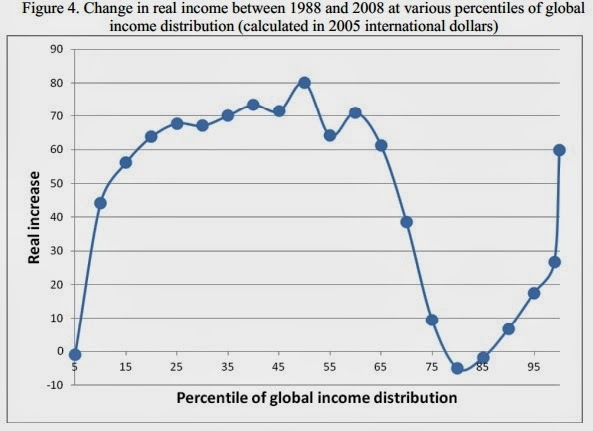 It shows the real income growth for each percentile of the income distribution, for 1988-2008. As you can expect there is convergence: people with lower incomes saw higher increases in their incomes than people at the end of the distribution. Yet there is an exception, at the total right, the people with the highest incomes also saw high growth. The reason for this is probably that their income consisted for a big part of capital gains, which as Piketty shows tend to grow faster than GDP. We can get information about income growth in different countries. Also by resume services online we can draw graph of income growth of many people. Some people have high income while some have low income. Thus people are spending lives according to their income. to get lots of robux for free online.